PINFERNO comes pre-loaded with 23 digital tables fully licensed for home or commercial use. 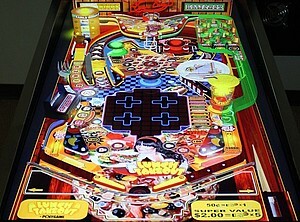 Plus, instructions are included on how to access a library of over 1700 more virtual pinball tables. 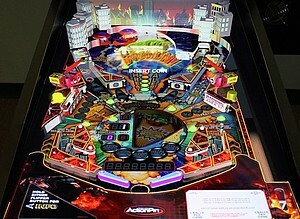 All PINFERNO 3D virtual digital pinball tables were created by enthusiasts of the pinball community - regular people who want to share their passion with you - from around the world. Plus, our machines come with the software that allows you to build you own table; be it a recreation of one of your favourites or a completely original masterpiece. Here are the tables, their authors, and the stories that bring them to life. Author: Steve Paradis, aka "polygame"
Description: From the author, "Despite the fact that it is a short game I still believe that it is a good 'party starter' just like those video game in the 80's. I never spent 6 hours playing pacman so I wouldn't know..but the reason I like 80' games is that you don't have a big story telling that you have to be engulfed into like most video game today. 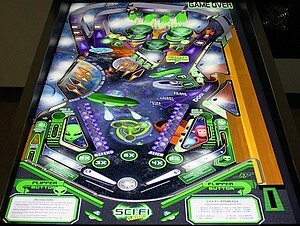 you can have only five minutes on your hands, and still have a good time just bashing around some Aliens..et voila! total stress reliever.. 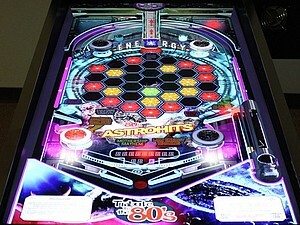 So AstroHits, just like the other 80' series, is not meant to transform your pinball experience into something deep and profound but at leas you might have a good time if you lose yourself into it." Description: From the author, "Okay, you are now in serious trouble...you gotta make One Million before the bank does and trust me partner, they are really greedy. Good news though, your silver ball is rolling the big life in the smallest casino ever, and the payoff is insane! So, take your place on the hot seat ... let's see if the Odds are on your side!" 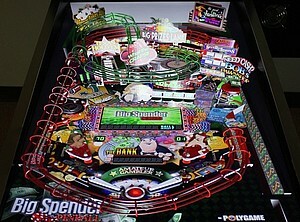 Description: One of the most original virtual pinball tables yet! 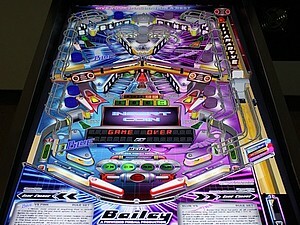 The playfield is split into 2 competing sides: blue and pink. Hit targets on the left, score for Blue; right scores for pink. The result is a simultaneous 2 player design with amazing music and brilliant graphics. Description: From the author, "The Cool Position Race: Complete Q-U-A-L-I-F-Y then Hit the Flashing Magnet. To make your car (the Red one) move along the track, toggle both flipper the faster you do, the faster you go! 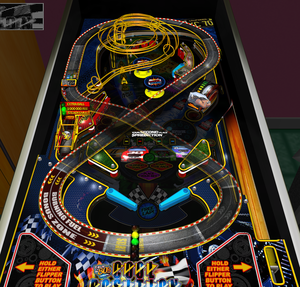 The Free Lap: Hit the Bumpers 3 times in a row. If you lose your Ball, it will be kicked back in the game. You need to recharge once used.Burning Fuel Bonus: In normal Game mode, wait for your car to be in the Burning Fuel Zone: you will then have 3 seconds to hit one of the flashing triggers. If you succeed, you will be granted with one of the related prizes. Nitro Boost: Collect the most you can before a race... It will give an edge over the other contestants. Mr.Oddtaker: Select which car might come up in second Double your chance to win. The Moving Targets: Hit the Moving targets to add up to the Next Race Jackpot. Pitstop Bonus: Unlock Pitstop by hitting left and right lanes beside the slingshot. Then hit the Pitstop to collect one of the 3 bonuses: ExtraBall, Steady 6 Multiplier or Add 1 million to the Next Race Jackpot." Description: From the author, "DarkQuest is based on my special interest about Medieval RPG and is also some sort of tribute to the too short PINBALL 2000 era. Two thumbs up to Chris Leathley for supporting my crazy ideas ... also a special thanks to Graham Jupp for inspiration!" Authors: "Anthias" and Steve Paradis, aka "polygame"
Description: From the author, "It's late. Danger can Strike at any moment. In every corner of the city there is a catastrophe in the making. The air smells like hot ashes and gasoline as another Pyromaniac lurks in the dark tonight... But the Flame Reaper Team is waiting Ready for the Blaze. The principle task in Flame Reaper 2010 is for you to extinguish the fire in order to get to the next Bonus Level. Problem is, the fire starts as soon as the game begins, consuming the building all the way to the top. If you let the flames get to the top the game is instantly OVER." Description: Enter the world of reptiles, amphibians, and insects. Knock down targets and activate jump mode so you can do, (what else?) cross the street, avoiding cars! 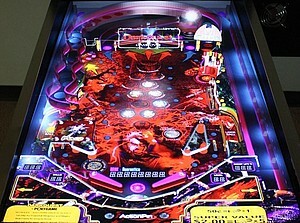 From the author, "I'm expecting some person to say that this kind of table is completely denaturing what a pinball is supposed to be and somewhat of no interest. 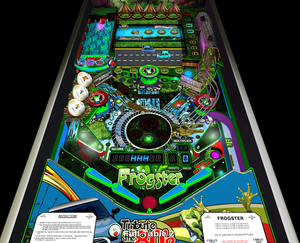 So if you recognise that line of thought in your opinion while trying FROGSTER, well...there is no need to comment about it since I beat you to it. ...and I would reply anyway this: 'Dude, you are totally missing the point of having fun'." Authors: Steve Paradis, aka "polygame", and Brendan Bailey, aka "PinWizKid"
Description: From the author, "Plenty-O-fun! Beat the Bush! Knock the 'Stomp Ball' hard enough to shake the Palm Tree. When done it gives you a fruit. Collect 5 Fruits for and Extra Ball. Lit B-O-Y to have a 30 second peace of mind! 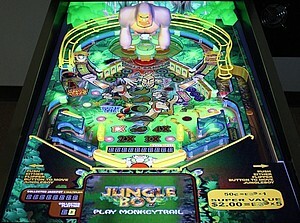 Activate J-U-N-G-L-E : Allow the game to be 'Ready' Tackle the gorilla: Each bump give you an extra second of Playtime. the more the better. YOU NEED 15 at least, to start the minigame. Monkey Trail GobbleHole: Shoot toward it to start the game. This is assuming you did the 2 steps above. The MiniGame - MonKey Trail: Avoid the MONKEYs rushing at you and Collect the GemStone. You move JUNGLE BOY with the left/right Flippers. To Cash In your collected Jackpot, you must absolutely hit a TRIBAL MASK.Pay attention to the time you have left. If you run out of it you simply go back to the pinball game itself with no bonus. Be Wise. It's Monkey Business! (pun intended)"
Description: From the author, "Junkyard Cats is a totally original, late 80s inspired virtual pinball machine with an unforgettable cast, stunning visuals, and a rockin' soundtrack. 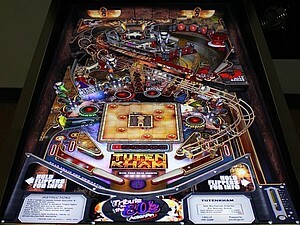 Junkyard Cats was designed to look, sound, and play just like a pinball machine from 1989. Sound too awesome to be true? ... Judge for yourself - it's free to play!" Description: From the author, "Always open late! Start your journey with a fresh multiplier. Our politics: Customers First! Top mezzanine wheel game is on when there is 5 clients or less. Try our delicious Megagulp: 10 sips to re-invigorate yourself! After hitting the shake 10 times in 20 seconds to collect an extra ball by reaching the trigger below. Fries with that? Hit a topping then collect bonus below. Build a stacker feature: knock down D-I-N-E-R, Reach the target using the ramp, complete the mini game 'all you can hit'. On to the second floor please! Spinning game: stop the wheel with the plunger to win succulent bonuses. Pasta bar: can you resist a super slide of fresh pasta? Early birds special: Match 2 breakfasts for 20000 Match 3 breakfasts for 50000 + extra ball. Exit to main floor: 'There is nothing good for me up here'. Cherry Pie Multiball: Hit the 3 sorbets bumpers to collect a dessert. 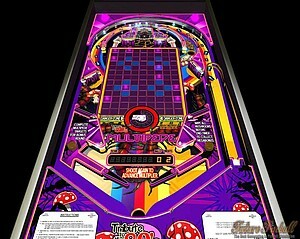 When you have collected each of them (9) send your ball to the right pit to start the cherry pie multiball. 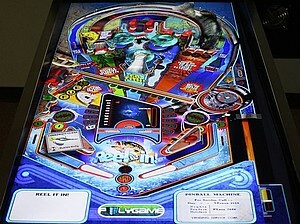 Special thanks to all of the beta testers for the project, and to all the supporters throughout the pinball community." Description: From the author, "Made from 100% Fun Extract! Ingredients: Destroy each Multipede before they get to the critical point. Kill 3 Multipedes to collect an extra ball. The quicker they die, the bigger the reward but also ... the faster they are going to be the next time. Hit M-U-L-T-I-P-E-D-E targets to access the Shroom Bonus Round. Ticks are pests making clear shot impossible... try to wipe them all as soon as you can. Also note that you cannot hit them while they jump. Beware the spider! You get caught, you lose points by the seconds! To escape her grip, toggle both flippers repeatedly as fast as you can. You can also hit the spider back (left and right kicker next to the spider). If you succeed, the spider will get out of the way and the target behind her will be clear to shoot for 60 seconds. Hit this target, and the multiplier will climb to 25x." 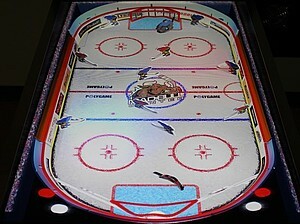 Description: Your own table hockey! 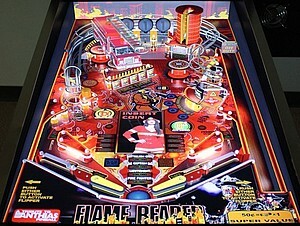 Using pinball physics, you'll face off for 3 periods of gritty action. Use strategy to pass and shoot, or the other team will make you pay! Description: From the author, " DIRT DIGGER: Hit the Bumpers to find new lures or baits, giving you the ability to fish more species of freshwater catches. The Display near the left flipper indicate which lure you have found. The number on it is the indicator of the fish to be attracted by this lure. The higher the number is, the tougher the fight with this fish will be. THE BALL SAVER: You can loose your ball up to 3 times before the drain gobble it. You can recharge on BALL SAVER by Hitting the far left lane trigger. IMPROVE LINE RESISTANCE: Lit all 4 L-I-N-E triggers to equip with Superior fishing Line. This give you the ability to go after any size of fish without too much of a fight! until the Floater sink, hooking a fish. Reeling : Again, toggle left and right flippers. You have to balance 3 things. The line tension, the timer and the fish distance. The Bigger the Fish...the more frail the line might be..so careful.. THE MARINA: Lit F-U-E-L to start the Boat traveling target. Hit the Boat traveling target to move forward the scenery (mini scrolling playfield). The Deeper you get, the bigger is the value of your catches when you go to trade them At the FISHMARKET. THE FISH MARKET: That's where the big Payoff is! Clear all 3 targets of the wood ramp and make your way to the bucket to weigh your catches. TODAY'S SPECIAL TARGET: When all 3 lights are lit, Everything you weigh at the FISHMARKET count DOUBLE. CHASING TACKLE: Hit the lit T-A-C-K-L-E target for an EXTRABALL. THE HIDDEN TRAIL: Knock on the REEL will show you the path to the Multiplier. BLAST FISHING MULTIBALL: When the TRAVELLING TARGET is on, HIT the TNT Sticks behind the FUEL targets. Then BOoMm!!!! Special Thanks to Shvmr for the Template. Francisco help for the efficient multiball script and also Kudos to kaiser47 for the Side Cabinet Art! THx Buddy "
Description: One of the favourites of the PINFERNO team! Alien robots have invaded the USA with one mission: eradicate humanity! Choose a mission and go to war - Rock 'em Sock 'em style - against robots displayed holographically. Try to get to the bonus lower level, too! From the author, "Special Thanks to rcadefrk for cool advice and testing. 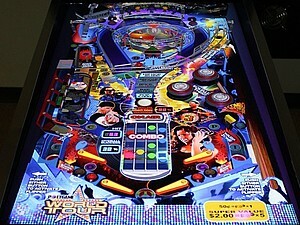 'Thanks to everyone else of the virtual pinball community who were 'involved in the project. Take the time to evaluate it as it is : 6 months of my life on earth. " Description: The table that started it all! Sci-Fi Classic is a fully playable example table to show how you can create your very own pinball creations via a simple to use interface. Included also is a detailed help manual to learn how the program works and how to control each of the objects the editor allows you to create. From the author, "We are taking a lot of effort to ensure that all the Models used ... are as exact as we can possibly make them"
Authors: "Gimli", "monnezzas", Steve Paradis aka "polygame", "Popotte", "Returnee", "Wild"
Description: Immerse yourself in the wild west with another incredibly detailed table. 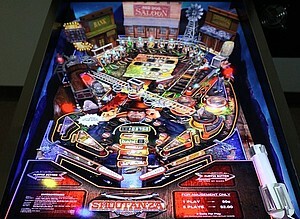 Rob the bank, havea shootout in the saloon, and blast into the mine. Pistols, coal cars, and windmills are just some of the cool 3D toys that complement the amazing soundtrack. From the author, "HOWDY PARDNERS! Welcome to Shootanza by Polygame. Shootanza was a little (french) flash games I made about 8 years ago for the Wii console. At the Time it only involved Shooting at cans with your mouse." 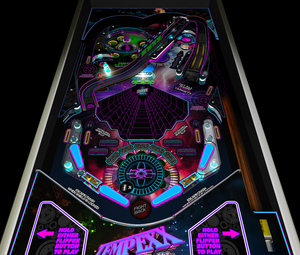 Description: From the author, "Tempexx Mode: Zap the Tempexx targets to reset each spawning starz. Keep them low at all times because if they reach the top, the column will be destoryed. When all the columns are destroyed, the game is over. Spikes Mode: Hit left and right lane to unlock the spikezone tube. Secure the ball in the tube to activate the spikezone mode. When on,use the flippers to destroy the spikes... you will have to find the right pattern to make it as quick as possible because each passing seconds chop the bonus off. The Stormper: Hit the ramp, then toggel the dlipeprs to activate the stomper. It is all about timing to collect all 4 targets. The Reactor: Hit each kicker once in the reactor to light them all up. When you succeed, you will be warped to the next level, restoring any damage you sustain. Each Tempexx level goes faster and faster." Authors: Steve Paradis aka "polygame", "shvmr"
Description: From the authors, " Steal everything you can! 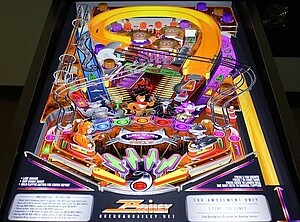 This table is the next installment of the Tribute to the 80's pinball series by polygame. Gerneal Tips: When in trouble to lose your ball, Hold both Flippers. If you have enough "Back from dead" credits left...your ball will be thrown back in the game! You can replenish these credits only by going to the snake pit. If the ball hit the 3 snakes you will be rewarded with one credit. Lower Playfield: Hit both scarab's targets of one of the GODS to discover an Artifact. Collect it by rolling over it with the ball. If you failed to do so in time, the artifact will turn into a scorpion which can only be destroy by hitting ANUBIS (Hyena head GOD in the middle) Clean the entire maze to ADVANCE to the next level. Be careful! The higher you get, the faster the ARTIFACTS turn into SCORPIONS. But also the bigger the REWARDS! Upper Floor: Chests in the King's Chamber (upperfloor) will open only if Keys were previously collected. 1 key open 1 chest. HIT both red scarab targets on the upperfloor to lower the bridge. If you succeed to make the loop by going through that path, you will be rewarded with a 100xMultiplier for everything you will HIT while on the upperfloor. If the ball goes back down. you will have to redo it all over again. Wak-a-Mummy: Chase the Mummy around!.. you know you waaaaannnt it big bonus Ahead. Against All Gods: Hi-lite G*O*D*S for a special reward. Collect Progressive Jackpot: Just like a slot machine! it goes up and up, all by itself as time fly by. If not collected after you quit a game, it will still be there for you to get the next time! When visiting the Bumpers area, you speed up dramatically the increase of this collectible bonus. To collect : wait for the flashing light at the entrance of the RIGHT LANE. When active, HIT the Wire Ramp to collect Big! Please don't be too greedy...Share the fun!" Authors: "Destruk", "Nash", Steve Paradis aka "polygame", "Popotte", "ruckage"
Description: This one is too creative for words! From the authors, "Ever wonder what a crossover between the guitar hero/rockband video games and a pinball table [would look like]? Here is your chance! It's your time to shine." Start the game with 3 minutes of playtime, with a choice of easy or hard mode. Hit the Tour Bus to receive the Cyclotron Jackpot and enter Video Mode: flippers select song, plunger starts mode. Complete all skill shots to receive the Skill Jackpot and Reunite the band! Spell the words "Rock", "Rap", "HipHop", "Raggae", or "Pop" to collect extra bonus!